Wondering where you can travel for summer and spend your vacation? 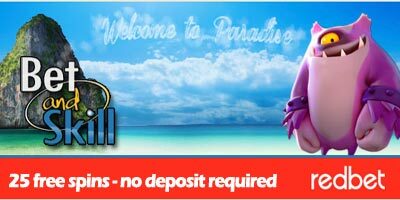 Redbet Casino will help you decide, with this exclusive €1,000 Trip to Paradise and 125 Free Spins! 25 free spins on Starburst don't require any deposit! Find here all the details! Make your summer special with a €1,000 trip to paradise! When you open an account with Redbet, they will give you 25 free spins on Starburst (no deposit required) and one ticket to a raffle where you can win a € 1,000 travelling gift certificate to a destination of your own choice! If you already have an account with Redbet or you want to improve your chances of winning, make a deposit: You will get 100 more free spins AND 5 more tickets! Use bonus code: paradise100 when making the deposit. In total you can get 125 free spins and win €1,000 vacation! Make sure to enjoy the sun this summer! This offer is exclusive to players from Finland, Germany, Norway, Sweden, United Kingdom, Austria and Switzerland. Minimum deposit of €20 required for the extra 5 tickets. Standard wagering requirements of 40x applies to any winning received from free spins. Redbet has the right to exclude any player from this campaign. Redbets normal terms and conditions are valid for this campaign. If the winner is unreachable for 72h, new winner will be chosen. Redbet reserves the right to prolong the campaign time. "Redbet Casino: 25 free spins no deposit required + 100 free spins + 1000€ vacation"